I'm sick of pennies. I'm sick of getting them back when I don't have exact change. And I'm sick of my car's change tray getting filled up with these slightly more than worthless copper engravings filling up my car's change tray. 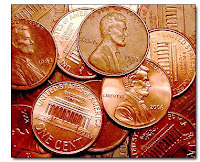 How can we tip this personal problem for me, and get rid of pennies for good? Oh yeah, and it costs more than $.01 just to MAKE a penny, so more than my personal grievances, they're not very economically sound either. My gut reaction is to just start paying for little purchases in pennies until an outcry is reached. But, all that will probably serve to do is get businesses mad at you. And they likely do not have the power to put a stop to the manufacturing of pennies. So, what about something like paying our taxes in pennies? Then the government can see how annoying they are. Any ideas like this that could tip this problem? I love it. This is just SILLY that we haven't tipped this thing yet. This by itself won't tip it, but first you might have to find an alternative for sales taxes or convince people to put up with rounding.